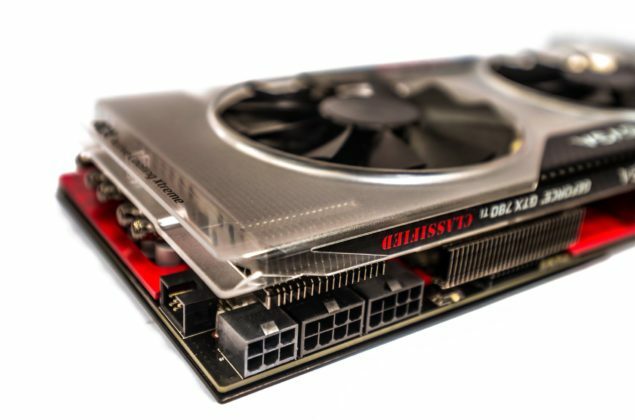 EVGA has posted a new picture of their upcoming GeForce GTX 780 Ti Classified K|NGP|N 3 GB showcasing the graphic card in its full glory. 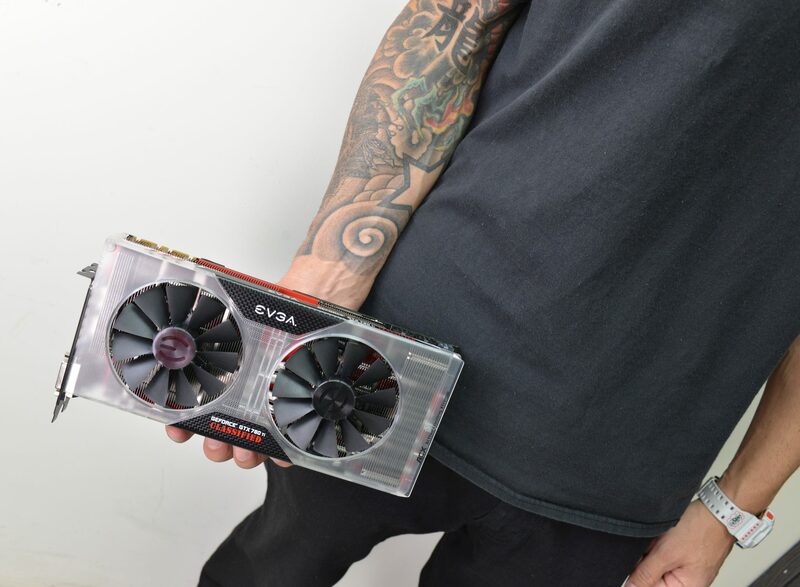 The EVGA GeForce GTX 780 Ti Classified is being prepared in collaboration with the company’s in-house and renowned overclocker Kingpin who has broken the past 1900 MHz with the graphic card on LN2 cooling. 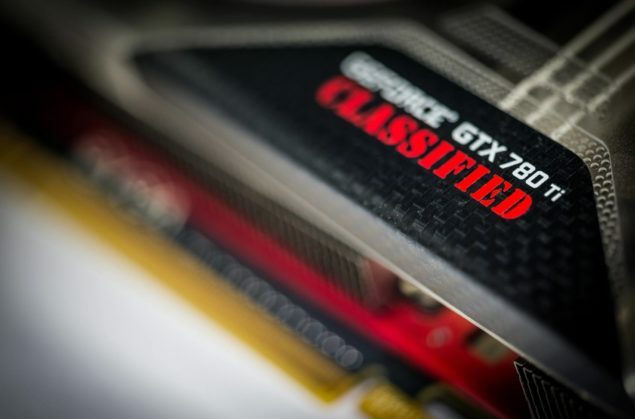 We know so far that the EVGA GeForce GTX 780 Ti Classified Kingpin edition as we know it features an absolutely stunning shroud design from what we have seen in the teaser shots. The whole shroud is translucent which means it has a transparent surface so you can see the heatsink below it. The shroud is covered with patches of carbon fiber where the logo’s are engraved and we can see the ACX logo at the back of the cooler which stands for Active Cooling Xtreme. But let’s see what’s under the hood, we are looking at a extremely powerful VRM design which we don’t have any information on at the moment but it is powered with an 8+8+6 Pin power configuration. So that’s some massive amount of power being fed to the board. Aside from that, we are also looking at an EVBOT connector that allows overclockers and enthusiasts to overclock and tune their cards as they seem fit. The heatsink itself has three aluminum fin blocks which are inter-connected via 5 or 6 heatpipes. The front of the PCB has a red colored base plate to support it while the back has a black colored plate with a huge KingPin logo but Jacob Freeman of EVGA has mentioned that its more than a logo and said to stay tuned for more info so we are going to wait and see what secret sauce is being held inside the KingPin Edition card. Plus, the card is going to feature 3 GB VRAM as opposed to the 6 GB VRAM report from early on and Jacob mentions the possibility of a 6 GB VRAM in the foreseeable future. The 1900 MHz core clock was achieved and stability was tested with a run of 3DMark Firestrike. Kingpin is currently not allowed to post results of the card but we may seem them very soon. The overclock was achieved without any custom modding on the card since the PCB has enough power to supply the core to achieve such tremendous overclocks. 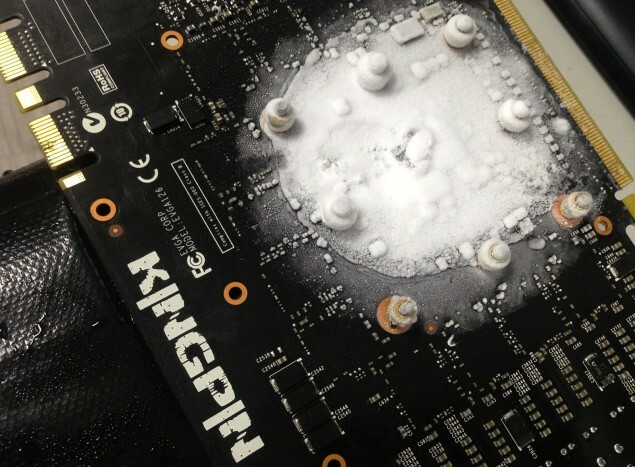 We may even see the core clocked past 2 GHz by other professional overclockers when it hit retails early January.